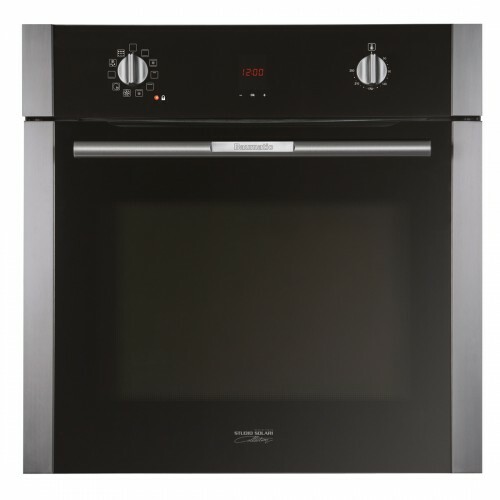 The BSPO610 is part of the Studio Solari collection which has stylish black optical glass with a titanium finish and is a self-cleaning pyrolytic oven. The pyrolytic mode uses no effort on your part or harmful chemicals rather high temperatures turn food residue and spills into ash that can be easily wiped away. This oven has 3 pyrolytic modes - economy for a light clean, normal for a standard clean and heavy. The 10 functions offer flexibility with cooking styles and the fan forced technology ensures even heat distribution and faster cooking times with food on all levels of the oven. The ergonomic electronic knob controls make cooking selections easy and the electronic thermostat gives you precise temperature control. The quadruple glazed doors ensure the oven door remains cooler and cavity cooling fan technology moves ambient air, cooling and protecting both the electronics of the oven and the cabinets in which the oven is housed.